The other night I had this insane craving for Chinese food. The problem is . . . whenever we go out for Chinese, I inevitably find some piece of meat floating around in the sauce. Or just taste that the meal was prepared in a pan that had previously had meat in it. Ick. Has this ever happened to you? And this happens pretty much at ever place we go. So, I'm not so keen on take-out these days. Even though Chinese is basically my FAVORITE. But, again, I was craving it intensely. I decided there must be a way to create convincing Chinese food at home. 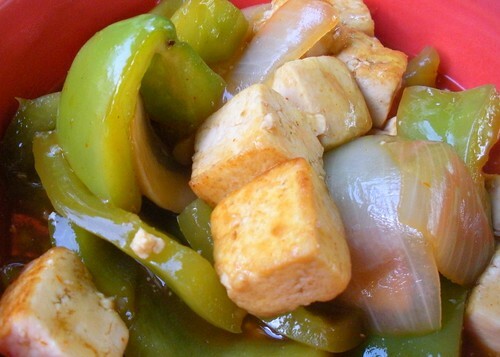 Enter a quick Google search for "sweet and sour tofu" . 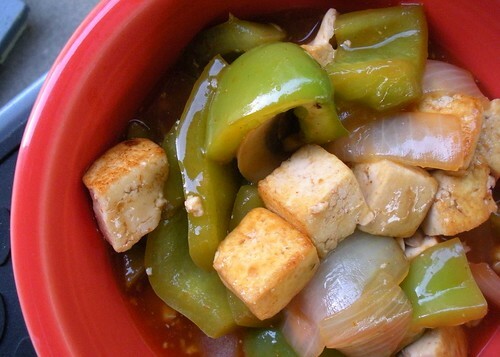 . . and this tasty recipe (courtesy of About.com) pops up and rocks my world. The most impressive part of the whole thing is the texture. It's exactly like the sauces you experience with the real deal. And though you won't believe it tastes great from these D-rate photos I took (too busy gobbling it down to break out my skills) . . . you just need to trust me. Try it! In a large bowl, mix together the cornstarch and vegetable broth, then add the vinegar, sugar, ketchup, soy sauce, ginger and cayenne pepper until well mixed. Set aside. In a large skillet or wok, stir-fry the garlic, onion, (and carrots) in oil about 5 minutes. Here's where I deviate from the original recipe. We fried our tofu. So, heat a splash or so of oil until hot in a pan . . . and then drop in your cubes of tofu. Keep stirring well to fry all sides while you continue the next steps. Add the pepper and mushrooms and stir-fry for another 2 to 3 minutes. Add tofu and allow to cook at least 5 more minutes. Thanks to Jolinda Hackett at About.com for giving this recipe to the internet world.